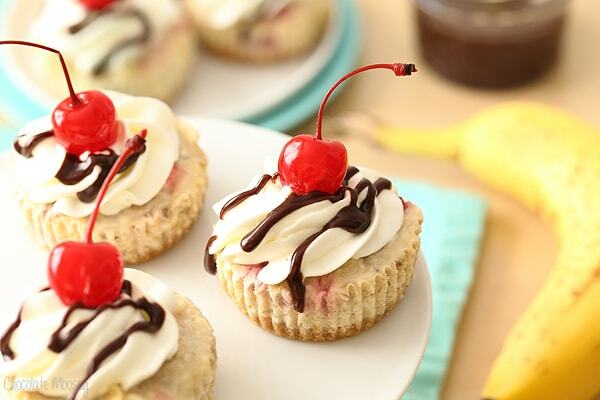 These mini cheesecakes taste just like banana split but without the mess of melted ice cream. Ideal to serve at parties or to a crowd of hungry cheesecake lovers. Did you watch Food Network Star this summer? I am a sucker for these food competition shows, so I’ve been watching Food Network Star since the third season. Even though it has jumped the shark a few seasons ago, I can’t help but continue to watch. From the beginning, I knew Jay would be a finalist and under nor mal circumstances the winner, but because this is television, he was almost too flawless and too obvious to win. Poor guy. I bet he’ll be on The Cooking Channel (you know, where they actually COOK) very soon. Eddie is definitely charismatic to pull it off and still good enough to be the winner, but I thought Jay edged him out just a bit. Wouldn’t you want your winner to be the absolute best instead of the second best? I was not impressed with the pilots at all where the finalists traveled to already-established restaurants and featured them. Um hello! Can you please cook something for your show? I’m tired of these shows finding the best of the best around the country. Until I’m traveling to that particular destination and actually looking for places to eat, I don’t care because I will never visit/remember these places. It’s great that these local establishments are getting highlighted and hopefully increased business from being featured, but please can we go back to cooking? Although I will admit Jay’s pilot has me craving chicken and waffles, and when they mentioned general tso’s chicken and waffles? I can’t wait to recreate that one myself. Another aspect Food Network is missing is a dessert show. Years ago, they did have Dessert First, but unfortunately the host was booted for plagiarizing recipes. Whether that’s true I’m not sure because there are only so many ways you can make frosting for German chocolate cake. 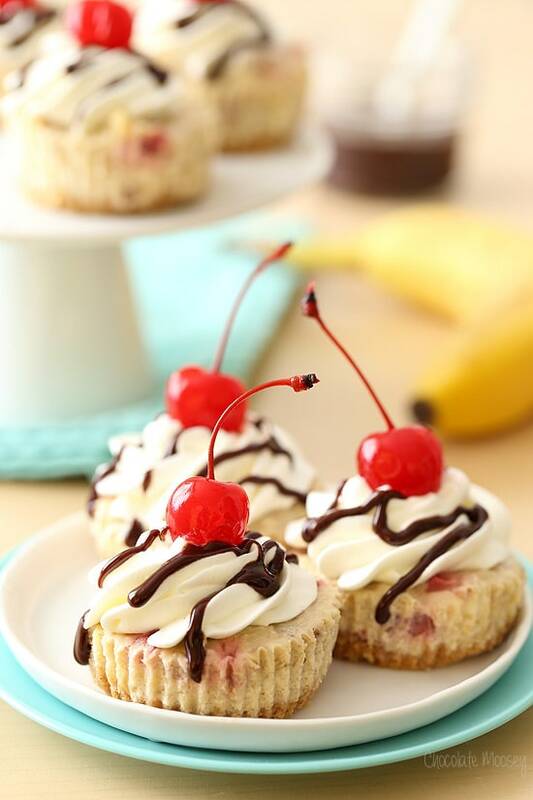 I guess until Food Network puts on another baking show, you’ll just have to keep coming back to my blog for your dessert recipes, including these Mini Banana Split Cheesecakes. 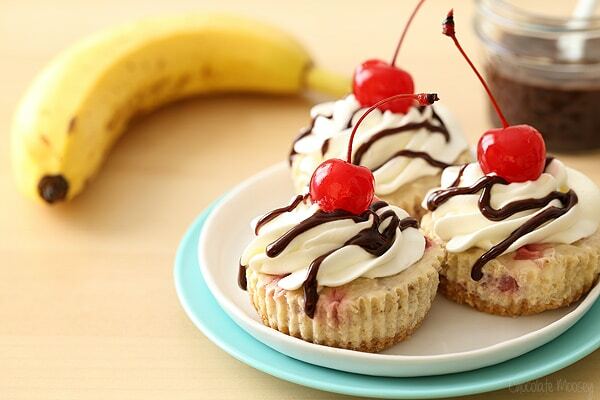 I wanted these mini cheesecakes to taste exactly like a banana split minus the melting ice cream part. 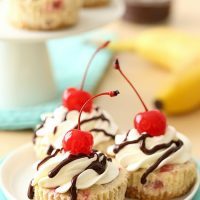 They are creamy, banana-y, and have all the toppings you’d expect from a traditional banana split. 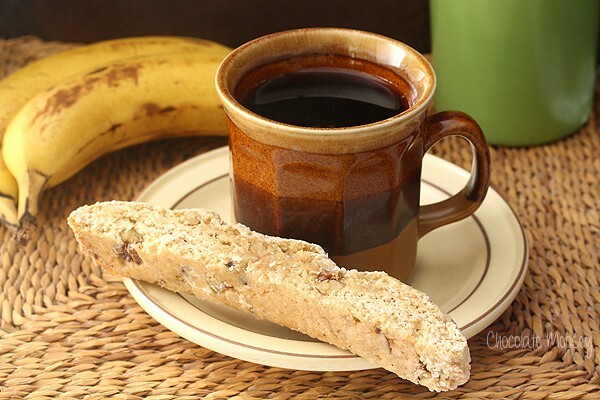 Did you know that banana splits were invented in Latrobe, PA? That is about an hour east of Pittsburgh and about 40 minutes east of my hometown. I think it’s fun to grow up near where something famous was invented. I’ve been to Latrobe a few times because the Pittsburgh Steelers have training camp there. I have not, however, eaten a banana split when I visit. Maybe I should fix that. Banana splits remind me of my dad because he loves to get them when we go to an ice cream parlor. Traditionally, banana splits are topped with pineapple, strawberries, nuts, hot fudge sauce, whipped cream, and of course a cherry on top. I wanted all of those flavors to be present when you take a bite into the mini cheesecakes. 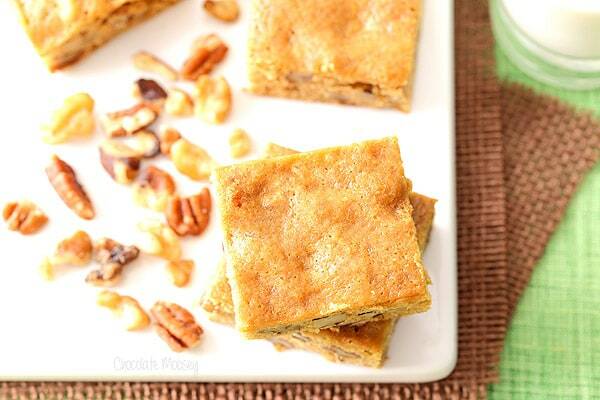 You might notice that the nuts are missing in the photos. That’s because after I finished shooting, I turned around and noticed the chopped nuts sitting on my kitchen counter. Oops. I would definitely recommend sprinkling some chopped nuts on top before serving. Prep time does not include 4 hour chill time. Preheat oven to 325F. Line a muffin pan with 12 cupcake liners. Mix together the graham cracker crumbs and butter. 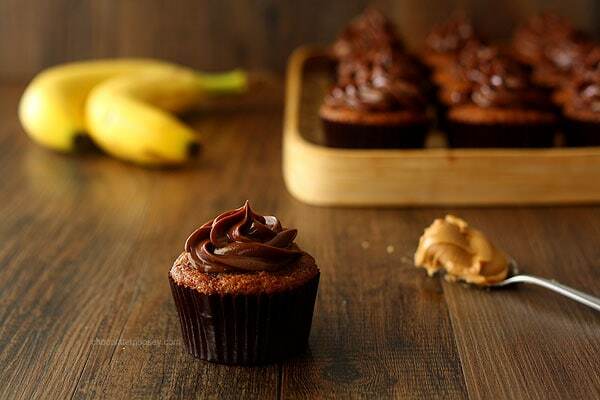 Press about 1 tablespoon of crumbs into the bottom of each cupcake liner. In a large bowl, beat together the cream cheese and sugar until smooth and creamy, about 2-3 minutes. Beat in the egg and vanilla then beat in the banana, pineapple, and strawberries. Fill each liner with the batter and bake 23-25 minutes or until the tops are firm when touched and a toothpick inserted in the center comes out clean. 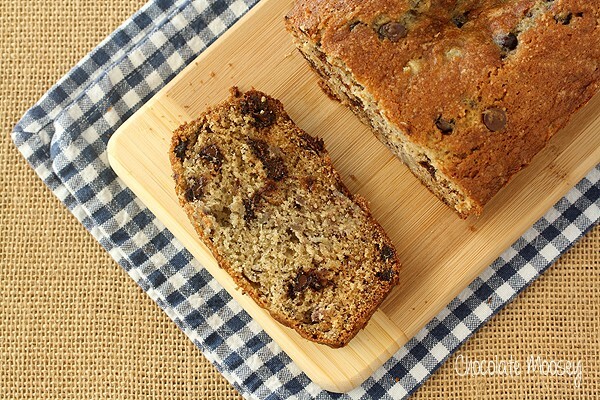 Cool completely to room temperature then refrigerate for at least 4 hours or overnight. Right before serving, top with whipped cream, hot fudge sauce, nuts, and cherries. Store leftovers in an airtight container in the refrigerator. 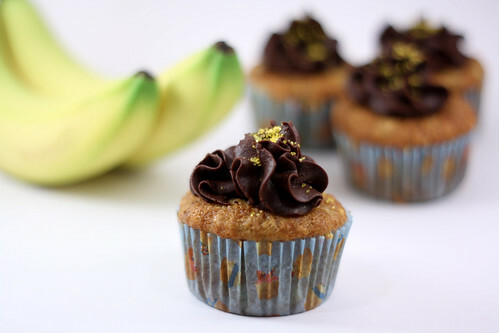 Disclosure: This recipe was originally developed for ONE Bananas. These are so clever and adorable, I’m in love! I love the photos! And the recipe seems easy I’ll definetly give it a try!